The Originals may be available for your next special event! It all began at the Motown Record Corporation in Detroit, Michigan, with Walter Gaines, baritone and Hank Dixon, second tenor, two lifelong friends. 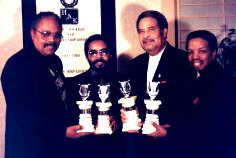 They auditioned Fred Gorman, base singer and songwriter, Tyrone Hunter, falsetto (at the time a solo artist) and C.P. Spencer, first tenor. At the onset of their career, The Originals worked mainly as back-up vocalists for several of the Motown roster of artists including Diana Ross and The Supremes, Marvin Gaye and Stevie Wonder. In 1969 Marvin Gaye (and Anna Gordy) penned a song for them titled "Baby I'm For Real." It proved to be a very successful collaboration and the record shot its way up the national charts. Their follow-up single, "The Bells" (penned by Marvin Gaye, Anna Gordy, Isis Gordy, Elgie Stover), echoed The Originals' previous success. To this day they are two of the most requested songs in their repertoire. During their long-term contract with Motown Records, eight albums were recorded. They explain that a certain stagnation had occurred in the group. Then, Motown relocated to Los Angeles and many of the artists and producers went as well, but The Originals stayed behind. They began to lose contact with the company so they finally decided that the move to the West Coast was paramount to their future. And indeed it was. They quickly re-entered the music mainstream with their number one disco hit "Down To Love Town." They further proved their versatility by writing and producing several of the tracks on this album. Fred Gorman (inspired by his job at the time) co-authored "Please Mr. Postman" recorded by the Marvelettes, then the Beatles, and in 1975 by The Carpenters. He also wrote "Just Like Romeo & Juliet" originally recorded by The Reflections and, more recently, by Sha Na Na. Having a hit record enabled The Originals to re-establish many good contacts and to reopen a lot of doors. One of the most important events was the signing of a recording contract with Fantasy Records in Berkeley, California. There they really flexed their musical muscles, writing their own material and producing themselves. There have always been five members of the group, but for one reason or another only four of them have ever recorded at one time until now. One of their newer releases, a driving disco version of the great standard "Blue Moon" serves as a fitting reunion for The Originals. Adding to it is producer/arranger McKinley Jackson, who played keyboards and wrote charts for the group's back-up band ten years ago and is an associate of Lamont Dosier, the famous writer/producer/singer whose name was sandwiched between those of Eddie and Brian Holland (Holland/Dosier/Holland) for several hit-making years. Lamont has worked extensively with the group, writing and producing. McKinley arranged and co-produced with The Originals an album on Fantasy Records with Phil Kaffel at the console. Their first album on Fantasy titled "Another Time, Another Place." In the music world where change is ever constant, it is rather unusual to find a group that has been together for more than 25 years, but then, The Originals is a most extraordinary group of guys  both individually and collectively. booking entertainment, such as major name entertainers or celebrities, booking The Originals, booking information on The Originals, or hiring The Originals for your special event, or to book or hire The Originals, or if you are seeking The Originals booking agent for corporate entertainment or for a private party. Consider the opportunity to book The Originals or other entertainers for a wedding, birthday, anniversary, business meeting or convention. If you are not a talent buyer, we are unable to provide The Originals manager or management contact information. Consider this your official The Originals booking agency web site – The booking agent who works for you! This company acts as an entertainment consultant or broker/producer and does not claim or represent itself as the exclusive agent, representative or management of The Originals. The Originals, funk and r&b music artists - booking agent. This group may be available for your event. Book them if you can. You will have the time of your life!